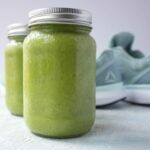 A quick and easy post-workout green mango recovery smoothie! Throw it all into the blender and blend until smooth. If your blender isn't large enough, blend half at a time. To lower the calories, adjust the mango amount. Also, keep in mind that 3 tablespoons of hemp hearts (120 grams) comes out to 680 calories itself. Adjust as necessary.